In recent years all inclusive vacations have become very popular thanks to lower prices, better food and a greater range of options on the market. What that means for the all inclusive industry is that visitors have more choice about where they go on their all inclusive vacation and therefore the destination takes center stage as opposed to the resort itself. The benefits of all inclusive vacations are numerous: You can completely relax, not having to worry about money and getting the check, feeling secure that the main expense of your vacation has already been paid for. This makes it much easier to budget your vacation, especially if you are traveling with children or in large groups: you no longer have to split the bill or have awkward moments about who is going to pay. Another benefit to all inclusive vacations is that the resorts cater for you on the basis that you will spend your whole vacation on the resort, therefore, they make sure you have everything you could possibly need. Even if you weren’t ever to step outside of the complex, your vacation would be idyllic. So, why choose Cancun for your all inclusive vacation? 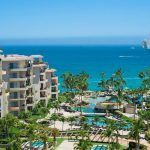 Besides the fact that Cancun, Mexico boasts some of the most idyllic all inclusive resorts and breathtaking Caribbean panoramas, the location itself offers something more than just spectacular sandy beaches and leisurely relaxation. Cancun is a place to explore the mystical ancient wonders of the Mayan civilization, boasting various archeological sites to exolore, such as Chichen Itza and Tulum. The luscious Caribbean surroundings also makes Cancun the perfect place for water activities, such as snorkeling, scuba diving and even swimming with whale sharks and dolphins. Cancun’s reefs bring visitors from all over the world to experience the marine life that lives beneath the calm tides of the Caribbean. Whether horse riding, ATV trekking, mountain biking or taking a round of golf at Playa Mujeres, there are many activities to keep you and all the family happy for as many days as your stay. For those who like to venture out at night, Cancun has a varied nightlife that caters to families, couples as well as groups, young and old. There is something for everyone in the hotel zone, although you may prefer to stay in an all inclusive resort a little further away from the hustle and bustle. With such variety and quality, when it comes to all inclusive vacations, Cancun has it all. Cancun is by far my favorite vacation destination!! I travel there every year and stay at a great, affordable resort called Sunset Royal Beach Resort, I highly recommend it!